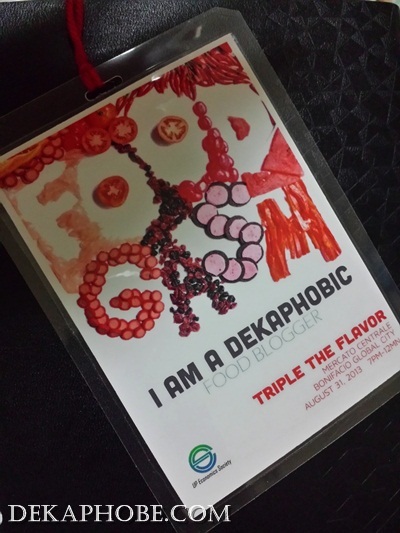 [i am a dekaphobic]: My Top Ten Picks at Foodgasm III! Last August 31, I was invited to be a part of UP Ecosoc's Foodgasm III at the Mercato Centrale as one of their food blogger-judges. Featured during the event are 29 food entries from various local food entrepreneurs. Some of them I have already tasted before in other food bazaars, while some were fairly new in the food industry. Visit them at their stall at Mezza Norte. I saw Flavor Avenue at "The Next Big Food Entrepreneur", but I wasn't able to taste the Bagnet Paella. Their localized paella was topped with salted egg, tomatoes, longganisa and bagnet. Truly satisfying and delicious! A healthier alternative to juices and smoothies is The Juice Barista. The Green Cayenne Reboot is a mix of lettuce, cucumber, spinach, lemon, kangkong, apple and cayenne pepper. I was initially apprehensive that the drink might be spicy, but wasn't. The cayenne pepper adds a nice kick to the drink. A chocoholic's dream is the Triple Dark Chocolate Tablea Fudge Bars. I was so tempted to bury my face in those fudge bars, but I guess other attendees should be given a chance to try this. hehehe. ChocoATBP also has chocolate paste for hot chocolate, tablea sugar cookies and pound cakes. After trying their Caramelized Wings at Levante Eastwood a few months ago, I meet B. Wings once again with their bestseller, the Black Mamba. With milk or beer served, I knew I was bound to explode with its spiciness. Damn, it was definitely HOT! One of the stalls that easily got my attention was Pepito's Pinoy Sorbet. The Sampalok Sorbet has the right amount of acidity, and a very good palate cleanser after a heavy meal. I'm personally curious about their other flavors, especially the Avocadoberry. Another chocolatey delight that blew my mind is the Belgian Choco Bites by Twisted Desserts. I know the photo didn't do it justice (bad lighting, in their area, sorry), but it was exceeded whatever expectations I had. A food market resident, Schmidt's Gourmet Hotdogs, served the Wagamama, which has Japanese curry and topped with cabbage and Japanese mayo. A must-try! The overall champion for this event is the Black Mamba by B. Wings. Sampalok Sorbet by Pepito's Pinoy Sorbet won the Expert's Choice Award, Wagamama by Schmidt's Gourmet Hotdogs won the People's Choice Award and Basil Seeds with Honey by Coco Royal won the Most Innovative Award. Mouthwatering list.Lucky you to be picked as a judge of this wonderful event. kainggit naman talaga. yum yum yum! The Green Cayenne Reboot somehow encouraged me to try juicing.hehehe. I gotta have that cookie flavored spread!